Throw out that old gas cylinder and call Catalytic Generators, LLC in Norfolk. Our safe, innovative products can transform your ripening room forever. Our products offer the safest ethylene application available, so call contact us today. Unlike compressed ethylene cylinders, there is absolutely no chance of ethylene explosion when using any of our generators as directed. 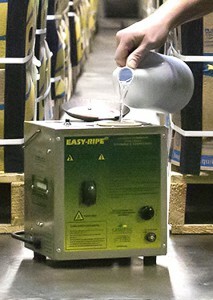 However, a 30-pound ethylene cylinder contains enough ethylene to reach the lower explosive limit (LEL) in most ripening rooms; in rooms that are 1,500 ft3 (43 m3) or larger, you make ethylene as needed with our equipment and do it at such low concentrations that there is no concern of ethylene explosion. That is why so many fresh produce companies across the world use our generators rather than gas cylinders. There are documented cases of explosions in ripening rooms where cylinders were in use. View our page on ethylene explosions. Our Ethy-Gen® II Ripening Concentrate is registered by the US Environmental Protection Agency (EPA), under the Federal Insecticide, Fungicide, and Rodenticide Act (FIFRA), and with the UK’s CRD for use as a ripening agent for bananas, tomatoes and other fruits.Some ethylene application product suppliers do not bother with these costly registrations and therefore users are in violation of law. This makes it easy to track inventory and reorder accordingly. With cylinders, how does the ripener know if there are 20 pounds or 2 pounds left? Likewise, how do you know that you are really buying 30 pounds? Without actually weighing the cylinder, you don’t… its guesswork. The CRS requires less attention than cylinders, thanks to a large supply of Ethy-Gen® II connected to the system. 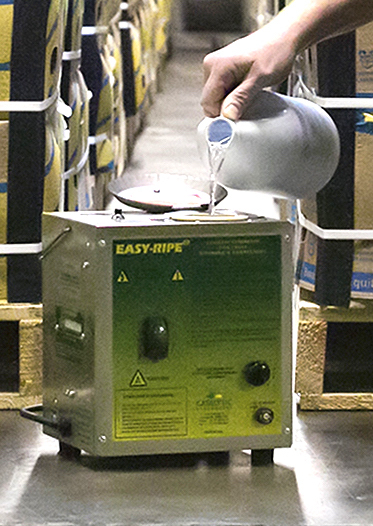 This container will last over 4 times longer than a 30-pound cylinder of ethylene! Also, our system makes it easy to change containers, with quick disconnect fittings.